He arrived on the big-league scene like a bolt of lightning through the evening sky. Fred Lynn played in his first game on September 5, 1974, and proceeded to smash major-league pitching to the tune of a .419 batting average and a .698 slugging percentage over his first 15 games. He followed that up with one of the greatest rookie seasons of all time, leading the Red Sox to the World Series and earning the Rookie of the Year, Most Valuable Player, and Gold Glove awards for the 1975 season. Lynn was the first player to achieve this trifecta, an accomplishment matched only by Ichiro Suzuki of the Seattle Mariners in 2001. Fredric Michael Lynn was born on February 3, 1952, in Chicago to Fred and Marie Lynn. When he was one year old his family moved to Southern California. He was an only child, and after his parents' divorce in 1965 he lived with his father, a textile service executive. Lynn grew up in the Lutheran Church. His ancestry is English, French, Spanish, Native American, Norwegian, German, and Bohemian. As a youngster Fred loved sports and enjoyed playing football, basketball, baseball, marbles, and track. Despite being raised in the Los Angeles suburbs, he was a San Francisco Giants fan. He preferred not the great-pitching/weak-hitting Dodgers, but the big bats of Giants sluggers Willie Mays and Willie McCovey. His favorite players as a child were Mays and Roberto Clemente. He respected them as all-around players, with hitting ability, power, speed, defensive excellence, and strong throwing arms. During his high-school years, Lynn pitched and played center field. In one game during his sophomore year, he pitched 13 innings. He could throw hard and also had good breaking stuff, but was a raw pitcher. No one worked with him on technique. As a junior he was 11-1 with a 1.01 ERA and many strikeouts. As a senior he went 6-5 with a sub-1.00 ERA. In football, he kicked and returned punts and kickoffs. Lynn wanted to be the first person in his family to attend college. The family told teams not to draft him, that it would take a lot of money to prevent him from attending college. Nonetheless, the New York Yankees selected Lynn in the third round of the 1970 baseball draft. He declined to sign, and entered the University of Southern California on a football scholarship. He also played baseball. Lynn was a teammate of future Pittsburgh Steelers star (and Pro Football Hall of Famer) Lynn Swann. On the gridiron on the freshman squad, he played wide receiver and defensive back, as well as kicker, punter, and returner of punts and kickoffs. Lynn said he played both offense and defense, and never came off the field. Although he enjoyed success as a football player, during his sophomore year Lynn switched his scholarship over to baseball. Lynn had met the Trojans head baseball coach, Rod Dedeaux, for the first time the summer after he graduated from high school. He played on a team of mostly high-school seniors that played the USC varsity. Lynn faced future major leaguer Dave Kingman, a 6-foot-6 pitcher at the time. Kingman, the hardest thrower he had ever faced, walked him on four pitches. After the game, Dedeaux told Lynn, "I liked the way you hung in there. "2 Dedeaux called all his players "Tiger." He gave players confidence and was a good role model since Lynn was a shy youngster. Lynn played for the USC varsity as a freshman, sophomore, and junior and the team enjoyed three years of amazing success, going 54-13 in 1971, 50-13 in 1972, and 51-11 in 1973, winning the NCAA Baseball Championship each season. Lynn was an All-American in 1972. He was named MVP for the US All-Stars during a series in Japan. In college he was a teammate of future major leaguers Steve Busby, Steve Kemp, and Roy Smalley, Jr. and also was a member of the 1971 Pan Am Team. At first, Lynn majored in business administration, but he became bogged down as a junior and switched into physical education. If he couldn't be a baseball player, he wanted to teach. He also enjoyed history. Lynn thought the Los Angeles Dodgers would take him with their first pick in the 1973 amateur draft, but instead they drafted Ted Farr, a catcher out of Spokane, Washington. They were hoping Lynn would still be available when it came time for their next selection. The Red Sox picked one slot ahead of the Dodgers and drafted Lynn in the second round. (The Red Sox took Ted Cox with their first pick.) Lynn signed with the Red Sox on July 9, 1973, for $40,000; Joe Stephenson is the scout credited with his signing. Lynn was assigned to the Red Sox’ Double-A affiliate in Bristol, Connecticut, where he played under manager Rac Slider. It was the first time he had played on the East Coast. He started off strong, but tired as the summer wore on and ending up hitting .259 in 53 games as the team finished third in the Eastern League’s American Division with a 62-77 record. It was at Bristol that he became a teammate and friend of Jim Rice. Lynn and Rice remained teammates with the Red Sox organization through 1980. They were both promoted to Triple-a Pawtucket for the International League playoffs and helped the Pawtucket Red Sox win the Governors Cup, as they defeated Tidewater three games to two and then Charleston three games to two, for the championship. In 1974 Lynn started with Pawtucket and made the league All-Star team, hitting .282 with 21 home runs and 19 doubles in 124 games. Despite having Lynn and Triple Crown winner Jim Rice, the PawSox finished last, going 57-87, under future Red Sox skipper Joe Morgan. Meanwhile in Boston, the Red Sox hired Darrell Johnson as manager and held first place for 101 days. In September and October, though, they struggled to a 12-19 record, while the Baltimore Orioles and New York Yankees passed them in the standings, going 25-6 and 20-11, respectively. What really killed the Red Sox that season was a stretch beginning on August 24, when they lost to the Athletics and proceeded to go just 8-20 through September 22. The Red Sox ended up winning 84 games, in third place in the American League East. Rice was recalled in late August, and Lynn was called up after the Triple-A season was over. Although the season ended up in disappointment, the future seemed bright with a core of talented young players like Lynn, Rice, Carlton Fisk, Rick Burleson, Cecil Cooper, Dwight Evans, Juan Beniquez, and Rick Miller. The pain of the collapse of the 1974 team was erased by the joy of 1975, with the team being led by rookies Lynn and Rice, who were known as the Gold Dust Twins. Rice had a fine rookie season, hitting .309 with 22 home runs and 102 RBIs, but Lynn was even better, hitting .331 with 47 doubles, 21 home runs, 103 runs, and 105 RBIs. He earned honors as American League MVP and Rookie of the Year and won a Gold Glove for fielding excellence. He led the league in runs, doubles, slugging average, OPS (on-base average plus slugging average), and runs created per 27 outs. He finished second in runs created and in batting average and fifth in on-base average. It was not only Lynn’s batting feats that drew attention, but also his wonderful fielding. He was terrific diving forward, snaring line drives, and jumping to reach over fences and take home runs away from hitters. During his career, Lynn earned four Gold Gloves: 1975, 1978, 1979, and 1980. In an interview with Jon Goode at Boston.com in 2004, Lynn reflected: "I am most proud of the Gold Gloves and really cherished those. I prided myself on playing defense. When I played basketball and football I always wanted to guard the toughest guy. When I played center field, I felt like I was guarding somebody and I didn't want any ball to fall in my area. I took it personally when balls would fall in and I didn't catch them." Smooth and graceful, Lynn batted and threw left-handed. As a major leaguer he stood 6-feet-1 and weighed 185 pounds. He was modest about his accomplishments. In the 1976 Complete Handbook of Baseball, Lynn said: "One man doesn't make a team. All the awards are great, but they are secondary to winning. If we didn't win, none of these awards would mean anything." During his magical 1975 season, Lynn staged a one-man assault on Tiger Stadium, on June 18, belting out three home runs (just missing a fourth), a triple, and a single, and driving in 10 runs in a 15-1 thrashing of the Tigers. The Red Sox clinched the American League East on September 28. They swept the defending three-time champion Oakland Athletics in the American League Championship Series in three games. Lynn hit .364 in the series. In the World Series the Red Sox took on the Cincinnati Reds, winners of 108 games that season. Most baseball experts predicted that the Reds would win easily, but the Red Sox battled hard and took the Reds to a seventh game. Many baseball fans consider that Series the greatest ever played. Five games were decided by a single run, two games went into extra innings, two others were decided in the ninth inning and in six of the seven games the winning team came from behind. The sixth game was perhaps the best World Series game ever played. 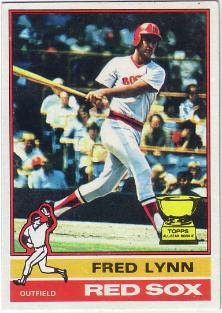 Fred Lynn was the on-deck hitter when Carlton Fisk blasted his classic game-ending home run off Pat Darcy leading off the bottom of the 12th. During that game, Lynn smashed a three-run homer in the first inning to give the Red Sox the lead. During a Reds rally in the top of the fifth inning, he crashed into Fenway Park's then-unpadded wall in left-center chasing a triple hit by Ken Griffey, Sr. Fenway became silent, but Lynn remained in the game after receiving attention from Red Sox trainer Charlie Moss. In the World Series, Lynn told moderator Bob Costas during MLB Network's Top 20 games in the last 50 years, "When I went down, I had absolutely no feeling from the waist down, so I just lay motionless. "3 Lynn played in all seven games, batting .280 with a double and home run, and five runs batted in, tying for the most on the team. After the season the Red Sox padded their outfield walls. Expectations were high for the Red Sox in 1976, but the season was a disappointment. The league champions had added future Hall of Fame pitcher Ferguson Jenkins to the roster, but won just 83 games, finishing third in the American League East. Longtime owner Tom Yawkey lost a lengthy battle with cancer on July 9. A 10-game losing streak from April 29 through May 11, a poor season by starting pitcher Bill Lee, and prolonged holdouts by Lynn, Burleson, and Fisk all contributed to a lost season. After Yawkey's death, the team was managed by a trust made up of his widow, Jean Yawkey, James Curran, and Joseph LaCour. In August 1976 Lynn, Burleson, and Fisk each agreed to five-year contracts. Owners and players signed a new Basic Agreement at the same time. Free agency for players was now possible. Lynn began that season on the disabled list, from March 24 through May 6, with torn ligaments in his left ankle. He ended up hitting .260 with 18 home runs and 76 runs batted in over 129 games. He made the All-Star team for the third time. The Red Sox swatted 213 home runs and improved to 97 wins and 64 losses, tied for second with the Orioles in the American League East. In 1978 Lynn's ankle returned to health and he had a fine season. He played in 150 games, the most in his career, and hit .298 with 22 home runs and 82 RBIs. He made the All-Star team for the fourth time and won his second Gold Glove. The Red Sox had a memorable season, jumping out to a big lead, slumping in September, bouncing back to win 99 games and tie the Yankees for the American League East title. The Yankees edged the Red Sox 5-4 in a one-game playoff in Fenway Park, a game in which Lynn singled and drove in a run. Lynn spent the offseason strengthening himself on Nautilus machines. In 1979 he enjoyed perhaps his best season. He led the American League in hitting at .333, on-base percentage at .423, and slugging at .637. He smashed a career-high 39 home runs, scored a career-high 116 runs, and had a career-high 122 runs batted in. He was named to the American League All-Star team for the fifth time and earned his third Gold Glove. He finished fourth in American League MVP voting. Those interested in statistical analysis will note that in the 1980 Bill James Baseball Abstract, Lynn had the highest value approximation method rating in the major leagues, earning 17 points. Under James's more recent Win Shares method, Lynn also led the majors with 34. The 1980 season would be Lynn's last with the Red Sox. He hit .301 with a .383 on-base percentage and .480 slugging percentage. On May 13 he hit for the cycle against the Minnesota Twins. His season ended on August 28. He was batting against Oakland A's starter Steve McCatty when he fouled a ball off his foot, fracturing his right toe. He was named an All-Star for the sixth time and won his fourth and last Gold Glove. Lynn was very successful hitting in Fenway Park. Over his career, he hit .347 with a .420 on-base percentage and a .601 slugging percentage in 440 games and 1,581 at-bats. By 1981, neither Lynn, Burleson, nor Fisk were with the Red Sox.7 A baseball strike wiped out the middle portion of the season. Lynn had to adjust to a new ballpark and struggled with a .219 batAtleeHammakerting average in 256 at-bats, the lowest average in his career. He was, however, named to the American League All-Star team for the seventh consecutive time. The next season was a much better one for both Lynn and the Angels. With a veteran roster of All-Stars like Rod Carew, Bobby Grich, Reggie Jackson, and Don Baylor, the 1982 Angels won the American League West Division, winning 93 games. Lynn had a fine season, hitting .299 with a .374 on-base percentage and a .517 slugging percentage. He was an American League All-Star for the eighth consecutive time. In the ALCS the Angels took on the Milwaukee Brewers in a best-of-five series. The Angels took the first two games, but the Brewers stormed back to take the next three. It wasn't due to any lack of productivity by Fred Lynn. He was the hottest hitter in the series for either team, hitting .611 with 11 hits in 18 at-bats, two doubles, a homer, and five RBIs to earn series MVP honors. In 1983 Lynn was named to the American League All-Star team for the ninth consecutive time. It was the 50th anniversary of the All-Star Game, and as in 1933, it was held in Comiskey Park in Chicago. Lynn enjoyed a memorable game. In the third inning with the bases loaded, Lynn stood in the batter's box against San Francisco Giants left-hander Atlee Hammaker . Lynn worked the count to 2-and-2, then drove a hanging slider into the right-field seats, the first grand slam in the history of the All-Star Game. The American League won the game, 13-3, its first win since 1971. Lynn was named the game's Most Valuable Player. During the regular season, Lynn hit .272 with 22 home runs and 74 runs batted in, a .352 on-base percentage, and a .483 slugging percentage. The next year, 1984, was Lynn's last season with the Angels. Playing in 142 games, the most in his Angels career, he hit .271, with 23 home runs, 79 runs batted in, a .366 on-base percentage, and a .474 slugging percentage. In October 7, 1986, Lynn married for the second time, this time to Natalie Cole. The couple had become acquainted while she was working on TV commercials in New Bedford, Massachusetts and he was doing a Ford TV commercial at the same time. On August 31, 1988, the Orioles traded Lynn to the Detroit Tigers for minor-league prospects Chris Hoiles, Cesar Mejia, and Robinson Garces. The Tigers were involved in a ferocious battle for the American League East crown, along with the Red Sox, Brewers, Blue Jays, and Yankees. Lynn contributed seven home runs in 90 at-bats in 27 games for the Tigers, who ended up in second place, one game behind the Red Sox. In 1989 the bottom fell out for the Tigers as they dropped to last place in the American League East, winning 59 games and losing 103. Lynn's batting average fell to .241 with 11 home runs in 353 at-bats. The end of his fine career was drawing near. Lynn was granted free agency on November 13, 1989, and he signed with the San Diego Padres. He would be returning to Southern California, this time playing for the first time in the National League. The 38-year-old Lynn got into 90 games for the Padres in 1990, making him a three-decade player. He batted .240 and hit six homers for the Padres and played his final major-league game on October 3. How good was Fred Lynn? At his best, he was a good as anyone, but injuries slowed his career down. There are seven skills in baseball: controlling the strike zone, hitting for power, hitting for average, offensive speed, fielding range, fielding reliability, and throwing ability. When healthy and at his best, Lynn did all these things well. Lynn worked as a baseball analyst for ESPN from 1991 to 1998, for CBS-TV in 1997-98, and for Fox TV in 1998, his last year in broadcasting. He was a consultant for Trinity Products’ MLB Product Line in 2002-2004. He also made appearances at autograph shows. Lynn became involved with Child Haven, a charity for disadvantaged children and donated memorabilia to help raise funds for the organization. In 1994 Lynn was inducted into the USC Hall of Fame. On November 14, 2002, he was inducted into the Red Sox Hall of Fame. He was elected to the College Baseball Hall of Fame in 2007 and was elected to the Ted Williams Hitters Hall of Fame in 2011. Lynn enjoys fishing, golf and tennis. As of 2014 he and his wife, Natalie, resided in Carlsbad, California. A version of this biography was originally published in " '75: The Red Sox Team That Saved Baseball," edited by Bill Nowlin and Cecilia Tan, and published by Rounder Books in 2005. Allen, Maury, Baseball's 100 (New York: Galahad Books, 1981). Ballew, Bill, The Pastime in the Seventies (Jefferson, North Carolina: McFarland Publishing, 2002). Dolan, Edward F. Jr., and Richard B. Lyttle, Fred Lynn: The Hero From Boston (Garden City, New York: Doubleday, 1978). Frommer, Harvey, and Frederic J. Frommer, Growing Up Baseball (Dallas: Taylor Trade Publishing, 2001). Gammons, Peter, Beyond the Sixth Game (Lexington, Massachusetts: The Stephen Greene Press, 1986). Hollander, Zander, The Complete Handbook of Baseball 1976 (New York: Signet, 1976). James, Bill, The New Bill James Historical Baseball Abstract (New York: Free Press, 2001). James, Bill, John Dewan, Neil Munro, and Don Zminda, eds., STATS All-Time Major League Handbook (Chicago: Stats, Inc., 1998). Neft, David S., Richard M. Cohen, and Michael L. Neft, eds., The Sports Encyclopedia: Baseball 2004, 24th Edition (New York: St. Martin's Griffin, 2004). Palmer, Pete, and Gary Gillette, eds., The Baseball Encyclopedia (New York: Barnes & Noble Books, 2004). Thorn, John, ed., Total Baseball, 8th Edition (Wilmington, Delaware: Sport Classic Books, 2004). Goode, Jon, "Catching Up With Fred Lynn," Boston.com, August 27, 2004. Sporting News Baseball Guide and Register, various years. Personal correspondence with Fred Lynn. 1 Children's ages are as of 2014. 2 Harvey and Frederic Frommer, Growing Up Baseball (Dallas: Taylor Trade Publishing, 2001), 144. 3 mlbnetwork-origin.mlb.com/network/games_airdates/. Retrieved October 22, 2014. 4 The sentiment was reflected in Whiteside's column "It Was A Whole Lot More Fun Last Year," in the June 11, 1976, Boston Globe. 5 The Sporting News, April 2, 1977, 21. 6 Jon Goode, "Catching Up With Fred Lynn," Boston.com, August 27, 2004. 7 Later on, the team would fall into the hands of Mrs. Yawkey, Haywood Sullivan, former player personnel director, and Buddy Leroux, former Red Sox and Boston Celtics trainer. The union would not be a happy one. In 1983 an acrimonious lawsuit took place. Sullivan and Yawkey wanted to run the Red Sox as Tom Yawkey had, but Buddy LeRoux always had his eye on the bottom line. Eventually LeRoux sold his interest in the Red Sox and Sullivan ran the team for Mrs. Yawkey. One wonders whether Tom Yawkey would have found a way to keep the three. 8 Fred Lynn letter to author, August 2014. 9 Frommer and Frommer, 148.